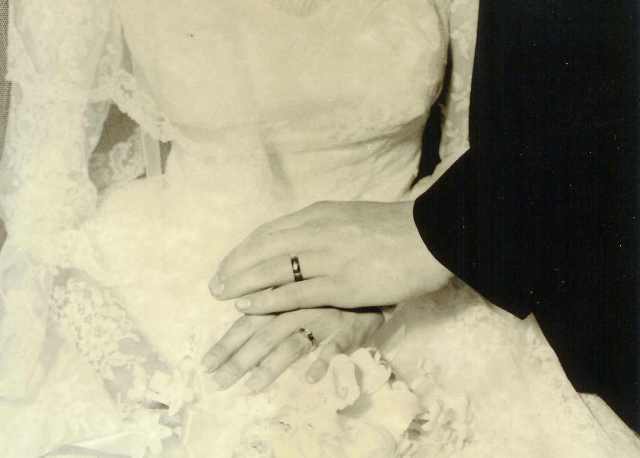 Sunday, July 17, 1960 at 2:00 p. m. I was married. Saturday, July 17, 2010 is my Golden Anniversary. On this special occasion I wanted to share my wedding day memories with my Wonderful family and Great friends. And, in celebration of my Golden Anniversary. 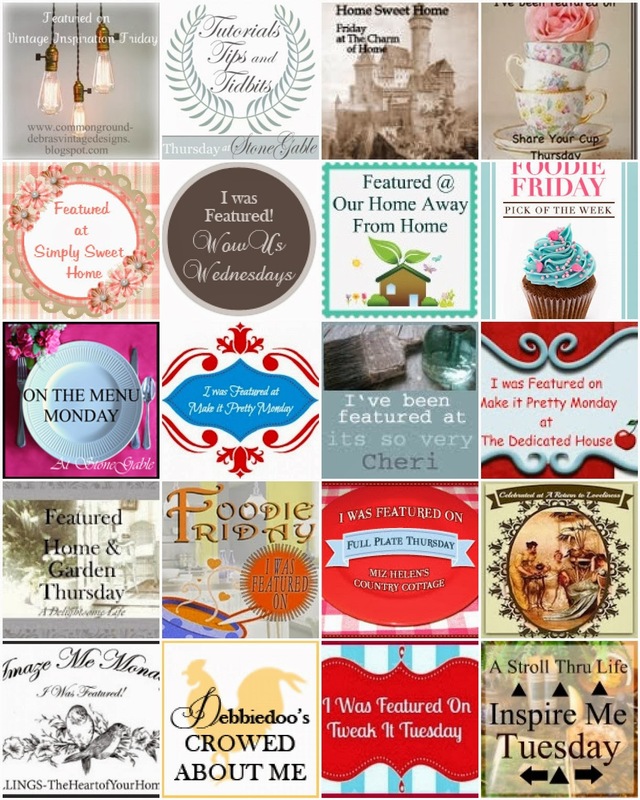 I would love to show you a few keepsakes I have saved for 50 years. 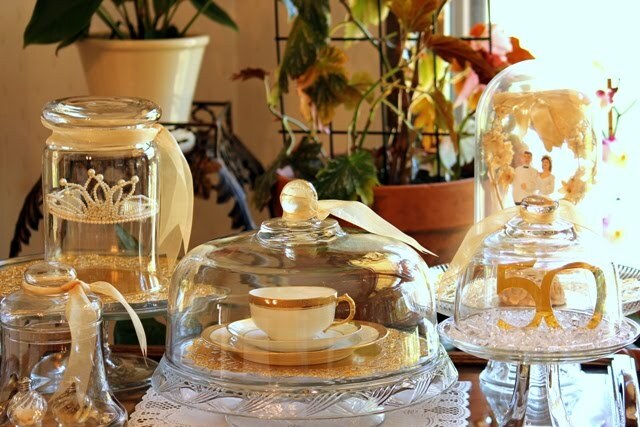 There is a Summer Cloche Party at A Stroll thru Life and I thought I would use cloches to show you my keepsakes. Between Naps on the Porch is having Tablescape Thursday. Golden Anniversary Tablescape is #4. The soft white cupcakes with white sugar crystals and gold papers remind me of my beautiful wedding cake and the lemonade is very refreshing on a hot July day. My thrifty find at a party store. 50 says it all. This is my Bridal Headpiece. Golden Anniversary reminds me of GOLD. I found this Limoges cup, saucer and dessert plate at an estate sale. Just one. OK!!! $10.00 dollars. I love GOLD. OK. You're asking why salt and pepper shakers? Well, our neighbor across the street from where I lived, gave me this pair of sterling silver salt and pepper shakers as a wedding gift. 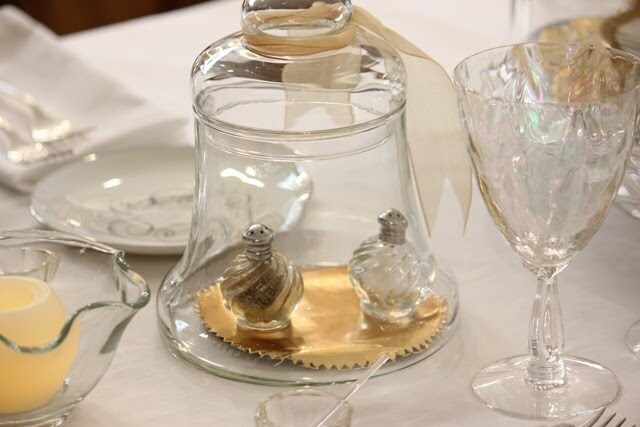 And, she said "If you give the bride and groom a pair of silver salt and pepper shakers it will bring them luck all through their married life". Oh my goodness, I think it worked. This pair sat on top of my wedding cake. And have moved around for 50 years in a shoe box. I was very careful with the bottom, because it's just about to fall into a dozen pieces. I'm so happy they made it to the party. 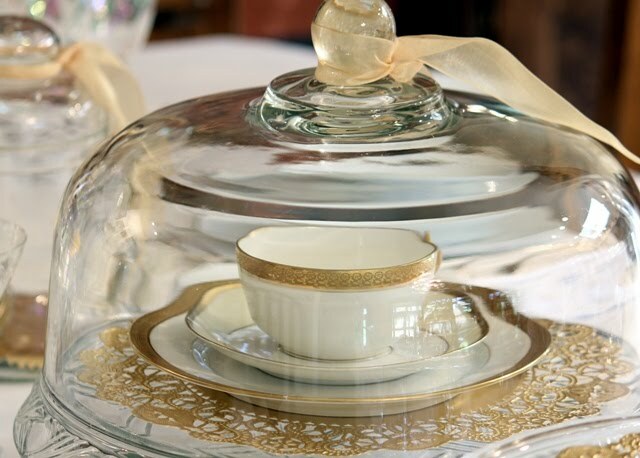 I set the table with my 'good china' Style House, Fine China with a platinum edge trim. It was made in Japan and the pattern is called 'Rhythm'. The silverware is 'First Love'. The salt cellar and spoon are vintage. And the crystal was a wedding gift from a very dear friend. The crystal is called 'Shell Pearl' by Fostoria. I received 12 Champagne, 12 Clarit wine glasses and 12 Water goblets. I registered for this pattern and I was so surprise when I opened the box and saw all the beautiful crystal. I still remember the feeling of delight. Thank you David for giving me this beautiful glassware. Group photo of cloches. Golden Anniversary. Bride and Groom 50 years ago. I know we look young. Yes, we were young. Thank you for visiting me and I hope you enjoyed my romantic story. I think Marriage is a life long journey. And, I am so blessed to have a husband who loves me and fabulous children and granddaughters who are my inspiration to live one day at a time and enjoy every moment. 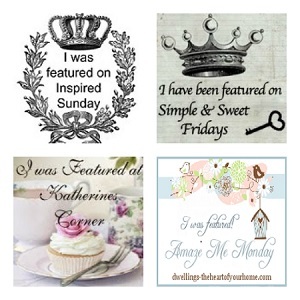 Please hop over to the fabulous blogs I am joining. Stunning detail. You were a beautiful bride. Congratulations! And what a pretty table you set, full of not only beautiful things, but memories too! Beautiful table! Congratulations on your first 50 years together!! I love that you used your original cake topper as part of your table! 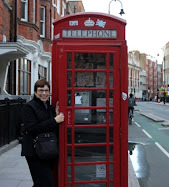 Oh, I am teary-eyed after reading your wonderful, sentimental post! And your silver pattern is First Love -- just perfect! I know your family is glad you've saved all these wonderful mementos all these years. They make a marvelous table! Happy 50th anniversary! How wonderful! I ams o happy for you! So special setting, love all your cloches! Congratulations! I loved your beautiful wedding photo. Your table is so pretty. The cloches set everything off so nicely. Your bridal headpiece is so beautiful. How lucky your family is to have all these treasures. Happy anniversary! Happy Anniversary! What a wonderful way to celebrate! 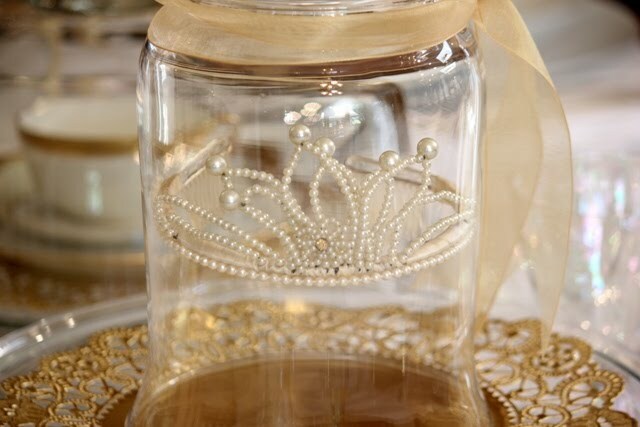 I love your cloches decorated with all mementos...just priceless! I love your wedding picture too! Gorgeous! Thanks for sharing. 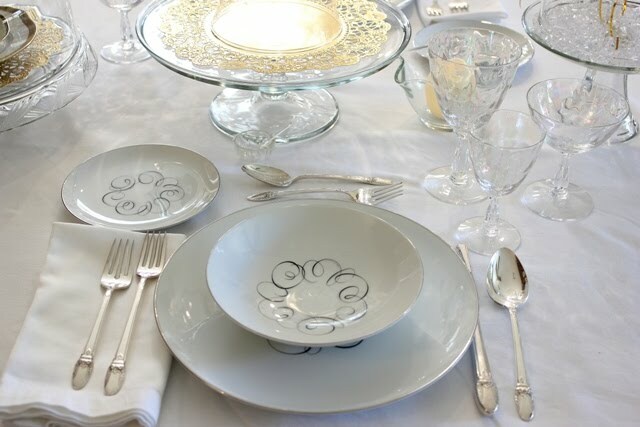 Such a beautiful and memory laden table setting...love it...and you were a beautiful bride and VERY young. What a wonderful way to celebrate your beautiful memories! Such a beautiful table too! Oh, what a beautiful bride you were! 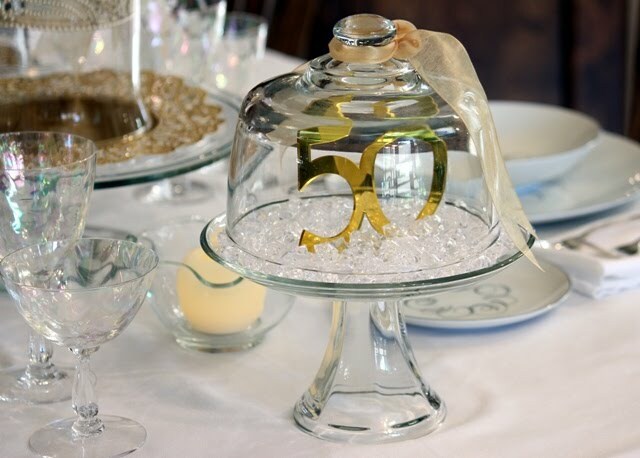 I do believe you have the most gorgeous and elegant cloche displays I've ever seen! Your table is so lovely too. Congratulations on your Golden Anniversary, you were a beautiful bride. 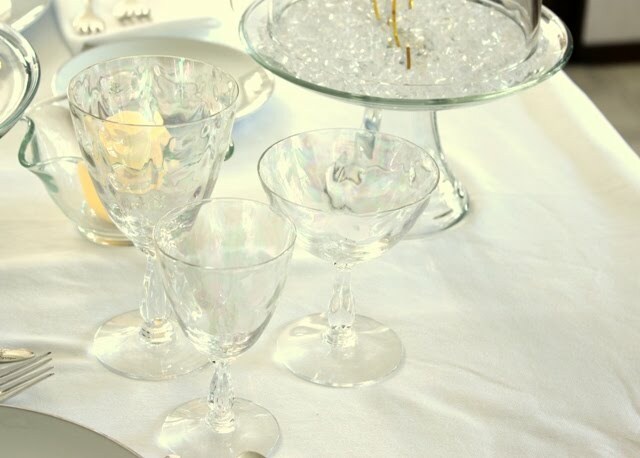 Your table is stunning with all the sparkling crystal and silver. Congrats on your 'Golden Anniversary'!!! 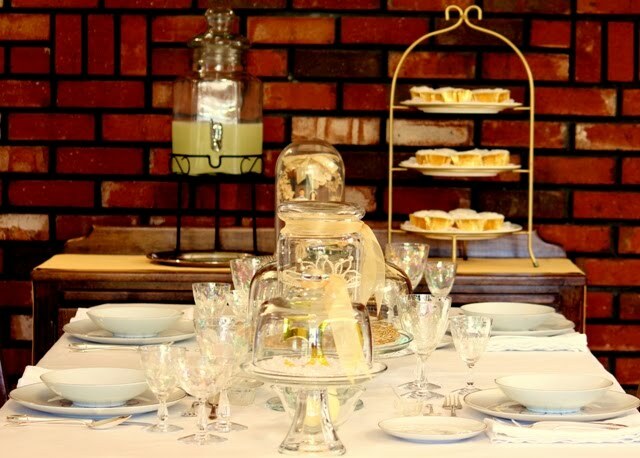 Your table is beautiful as well as YOU and your walk down memory lane! Thank YOU so much for sharing! wow! Congrats on your Golden Anniversary and your table setting is just awesomely beautiful! love the colours you used! A beautiful visual love story. I think it is wonderful and a great blessing that you not only still have your Sweetie but also lovely things from your wedding day. Best things to put in a cloche EVER!!! This is simply beautiful! HAPPY GOLDEN WEDDING ANNIVERSARY TOM & BETTY!!!!!!!!!!!!!!!!!!!!!!!!!!!!!!!!!!!!!!!!!!!!!!!!!!!!!!!!!!!!!!!!!!!!!!!!!!!!!!!!!!!!!!!!!!!!!!!!!!!!!!!!!!!!!!!!!!!!!!!!!!!!!!!!!!!!!!!!!!!!!!!!!!!!!!!!!!!!!!!!!!!!!!!!!!!!!!!!!!!! Well, Betty..that was the nicest piece I've read in a very long time! Congratulations on your 50th anniversary..I'm a big fan of marriage, (43 yrs. for me), and a sucker for romance so I find your cloches and the whole presentation just delightful. Thank you so much for sharing that special story! Congratulations on your Golden Wedding Anniversary! It's wonderful that you still have all of those items to place under glass. I couldn't tell you where my wedding topper was, whatsoever! What a beautifully set table. Enjoy a fantastic celebration together with your hubby. Betty, this is the prettiest display! I adore things like this! What a beautiful table filled with many memories. You were a beautiful bride. This is a charming post!!! We just celebrated 13 years and I thought THAT was good. A Golden Anniversary...FABULOUS!!!! Congratulations! Congratulations! Beautiful table and what a wonderful way to share memories. Here's wishing you many more! I like how you made the event special. CONGRATULATIONS ON 50 YEARS OF MARRIAGE!! THAT IS WONDERFUL TO HEAR IN THIS DAY AND AGE! WE ARE COMING UO ON OUR 40TH SOON, AND WE TEACH MARRIAGE CLASSES AND COUNSEL AT TIMES, SO IT REALLY BLESSES MY HEART WHEN I HEAR OF LONG TERM MARRIAGES WHERE PEOPLE STILL LOVE EACH OTHER AND ARE STILL HAPPY!! WHAT A BLESSING FROM GOD!! 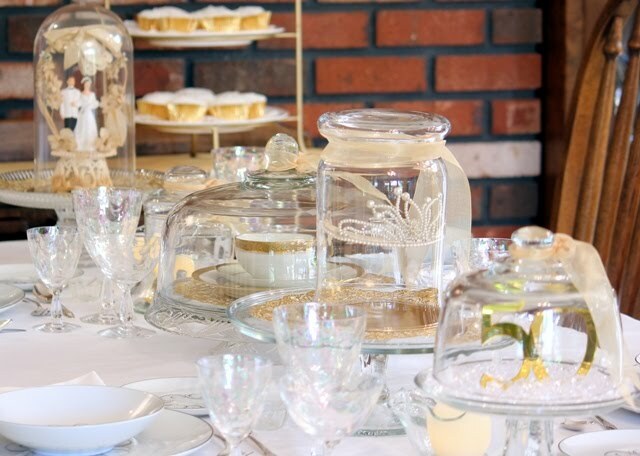 LOVED YOUR PRETTY TABLE WITH ALL THE CLOCHES AND YOUR BEAUTIFUL WEDDING PICTORE. HAPPY ANNIVERSARY AND MAY YOU HAVE MANY MANY MORE!! CONGRATS to you dear! Lovely pieces and what a beautiful couple ( I am sure you still are too! ) 50 heartfelt blessings to you today! 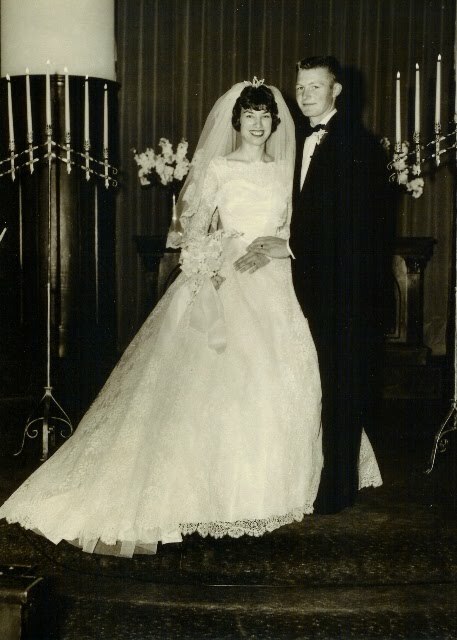 Congratulations on your 50th wedding anniversary and sending my wishes for many more! You made such a beautiful couple. Love the headpiece you wore. Its hard to believe 1960 was 50 years ago but I did the math and yes sure enough... :-) Beautiful post. That is absolutely fantastic, congratulations. I have never seen such a classy way to celebrate a 50th. I absolutely love your headpiece, it is a real treasure. Thanks so much for sharing your special day with us. May you make it to 65th and do a spectacular post on it too! What a heartwarming story and what beautiful rememberances you have! Happy Happy 50th Anniversary!! Congratulations on your 50th anniversary and what a wonderful way to celebrate. 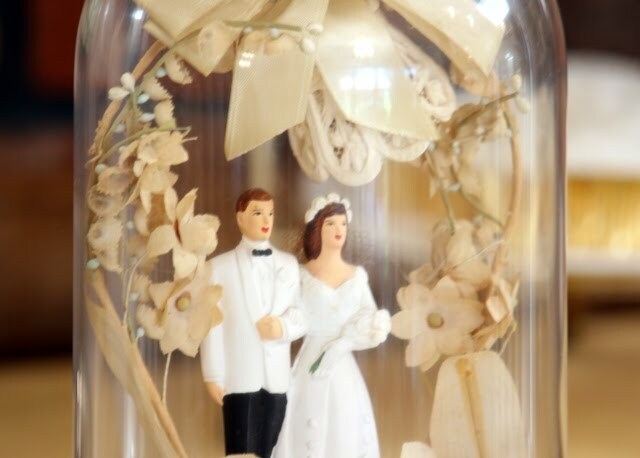 I love your cake topper. I used my mother and father in law's cake topper on my wedding cake, 22 years ago. I treasure it and have it sitting in my china cabinet. Thank you so much for participating in Summer Sundays! Looking forward to seeing you next week. What a gorgeous bride you were and still are!!!!! I love your head piece, so very pretty! Happy Happy 50th to the both of you! Happy Anniversary! My sister just celebrated her 50th too. You are blessed! Happy Anniversary! Could you please post your recipe for such a fabulous,long lasting marriage? Congratulations on 50 years together. You put together a very beautiful and meaningful table. Betty, Beautiful wedding pictures. Yes you looked and were young, but your love was real and you have been blessed all these years. What a wonderful love story. Wow! Betty! Thanks for sharing! What an inspiration!